Our 2011-12 season Songlines will explore the world and its connections through both traditional and unexpected music, unveiling the pathways that sing the world into existence. We kick off the season with our annual Salon concert fundraiser, Where in the World is WomenSing, at the Lafayette Veterans Memorial Building. Our featured composer this year is Sandra Milliken. Her music is fresh and imaginative, written with the sound of expressive voices in mind; Milliken is a composer whose skills as a choral conductor are clearly apparent. 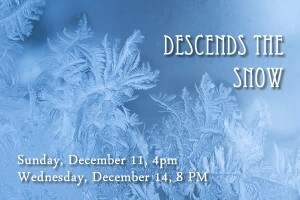 Descends the Snow in December will feature a broad range of seasonal music celebrating the mystery and beauty of winter landscapes. Snowflakes by Milliken is an evocative and beautiful setting of a Longfellow poem (listen to this soundbite), and her lively Hodie Christus natus est for SSAA, triangle and tambour, is fresh off the press (just composed in 2011). You will feel the flame of love with the stunning harmonies of Eric Whitacre’s Five Hebrew Love Songs, we will bring back the spacious Christine Donkin Magnificat, and traditional works by Duruflé and Elgar will complement. We will close with snow-related festive holiday fare, and David Conte’s Christmas Intrada, a delightful potpourri of carols for SSAA chorus and four-hand piano. 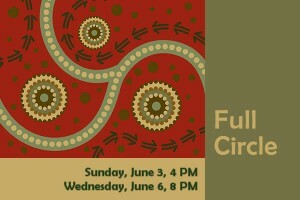 In early June we will come Full Circle, which will be our concert theme. We will feature Sarah Hopkin’s Past Life Melodies, the Australian piece that has taken the choral world by storm. Its open-throat singing, earthy drones, and aboriginally inspired overtone singing will definitely be the unexpected (check out Chanticleer performing this piece). Along with that we will travel three continents with music by Mechem, Brahms, and Milliken’s Fanfare of Praise, and a world premiere of Bright Stars are Rising, commissioned to celebrate Martín Benvenuto’s 10th anniversary as artistic director of WomenSing! Acalanes High School Bella Voce and the Contra Costa Children’s Chorus Honors Ensemble will join us in unveiling our fourth-year YIY commissions by Anastasia Pahos (Australia) and Dale Trumbore (U.S.), both writing a setting of the beautiful River of Words poem Reflections. For a complete list of concert dates and locations, check out the Current Season page.